Isolation is one of the properties of SQL Transaction. Isolating / separating transactions from each other to maintain Data Integrity in Database is called Isolation.Before going to implementation part of isolation, we will understand why isolation is required in database ? Why Is Isolation Level Required ? Let's take an example - Suppose, there are 2 users accessing the same table, at the same moment, to update the same row. Each transaction is unaware of the other transaction. User A updates the row and then User B updates the same row. What happened here is the last transaction made my User B overwrites the updated record of User A and User A lost his/her data in the table. This is otherwise known as Uncommitted Dependency. Let's take another example - Suppose, User A and User B are accessing a table row at the same time. User A wants to read and User B wants to update the row. In the friction of time difference, transactions are executed. So, when User B not yet updated the row (during the update process), User A reads that row and got the old record which may not be correct for his/her operation. This situation is known as Dirty Read. This is also known as Phantom Problem. Let's again take another example - Suppose User A is granted to insert a row but the same time User B inserted that row. Now, when User A tries to insert, he/she can't. Then, he/she will get angry and say- "Hey you committed that this is available for me to insert, but you cheated on me and granted someone else to do so !" . You may/might get this problem while the reservation of Train/Movie ticket. This is also known as Non-Repeatable Problem. Let's take the same example of User A and User B. Suppose, User A executes a transaction having three queries - a stored procedure or transaction or individual query with a batch. 1st query is to read a table row, the 2nd query is to update that, and the 3rd query is to read that again. By doing this, User A wants to generate the report. As we know User B is not a gentleman he always spoils the intention of User A, he accessed the table row in between the two Read queries of User A and did some operation like Delete ! Now, User A has already modified the data and when he wants to read it again, he is surprised ! He got inconsistency in data. In the above-mentioned points, we understood that - as User A is a weak person, User B always plays with User A and forcefully does it's job by dominating him. But as a Database Administrator or Developer, we need to help the User A. Now, we have a weapon called "Isolation Level" by using which we can cooperate User A to maintain its integrity. SQL Server provides 5 Isolation levels to implement with SQL Transaction to maintain data concurrency in the database. Isolation level is nothing but locking the row while performing some task, so that other transaction can not access or will wait for the current transaction to finish its job. Let's write a transaction without Isolation level. In the above code snippet, we have not implemented Isolation Level. Therefore, there are chances of data concurrency. Now, we will go through all the five Isolation levels and find the solution for our situation. When this level is set, the transaction can read uncommitted data resulting in the Dirty Read problem. With this isolation level, we allow a transaction to read the data which is being updated by other transaction and not yet committed. Suppose User A is trying to read a row which is being updated by User B. Here, we are allowing User A to read the un-updated/uncommitted data i.e old data. This prevents Dirty Read. When this level is set, the transaction can not read the data that is being modified by the current transaction. This will force user to wait for the current transaction to finish up its job. Suppose User A is trying to read a row which is being updated by User B. Here, we are asking User A to wait for the User B to finish its update task, and giving the updated/correct data to User A. But the problem with this level is - it can't resolve Phantom Read or Inconsistency Analysis i.e it asks User A to wait for Read but not for update or insert. This level does every work that Read Committed does. but it has one additional benefit. User A will wait for the transaction being executed by User B to execute it's Update query as well, like Read Query. But Insert query doesn't wait, this also creates Phantom Read problem. This level takes a snapshot of current data. Every transaction works on its own copy of data. When User A tries to update or insert or read anything, we ask him to re-verify the table row once again from the starting time of its execution, so that he can work on fresh data. with this level. We are not giving full faith to User A that he is going to work on fresh data but giving high-level changes of data integrity. 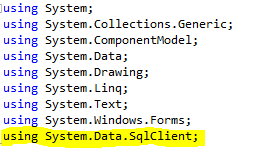 This is the maximum level of Isolation level provided by SQL Server transaction. We can prevent Phantom Read problem by implementing this level of isolation. It asks User A to wait for the current transaction for any kind of operation he wants to perform. Isolation level also has a problem called "Dead Lock"- "Both the transactions lock the object and waits for each other to finish up the job". Dead Lock is very dangerous because it decreases the concurrency and availability of database and the database object. We will discuss Dead-Lock in the later part of this topic. Hope, I covered the necessary points that can help many of us to implement Isolation level in the project with the identification of real situations. Believe me friends, it is a good practice to implement Transaction with "Isolation Level" in every type of projects. In this post, I will show you how to using bigint with FORMATMESSAGE. SQL Server 2016 added the FORMATMESSAGE function. According to Books On Line, FORMATMESSAGE constructs a message from an existing message in sys.messages or from a provided string. The functionality of FORMATMESSAGE resembles that of the RAISERROR statement. However, RAISERROR prints the message immediately, while FORMATMESSAGE returns the formatted message for further processing. So there you have it, if you want to use bigint with FORMATMESSGAE use I64d as the type specification, or convert to varchar and use s as the type specification. 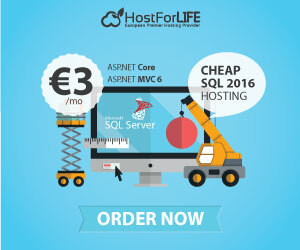 SQL Server 2016 Hosting - HostForLIFE.eu :: How to Auto Increment ID Column Using nvarchar DataType In SQL Server? This article is about Auto Increment ID Column using nvarchar datatype in SQL Server 2016 . SQL server provides identity property to get auto-increment record values where the datatype used is “int”. This article explains a way to use nvarchar datatype column to get auto-increment record values. This article provides a solution to use alphanumeric record ids incremented automatically. 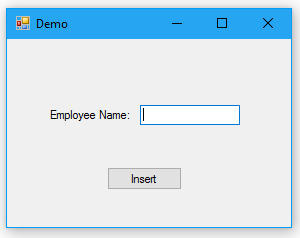 The above figure shows the use of a textbox to enter name in the ”employee” table where the id is auto-incremented. 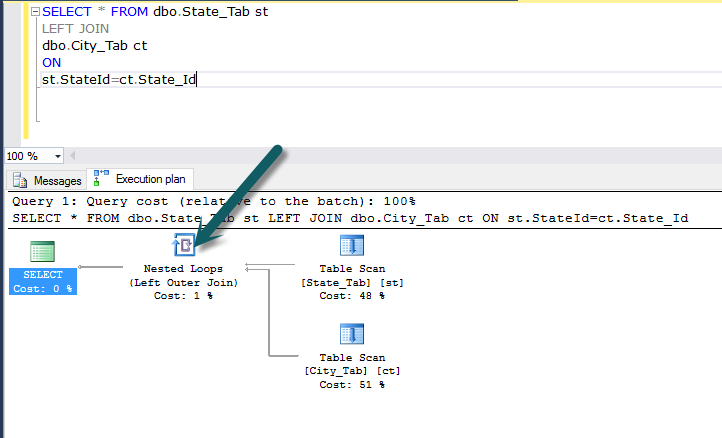 Create 2 methods OpenConnection() and CloseConnection() to handle the SQL Server Connection object. Here a method AutoIncrementID() is used to do the task of auto-incrementing based on the last entry inserted in the table. //The function ZeroAppend is used to append “0” after the prefix to the code. SQL Server 2016 Hosting - HostForLIFE.eu :: How to Implement Inner Join When Query Contains Outer Join? This is something interesting; i.e., how to enforce the compiler to use the inner join instead of the outer join. Let's take an example. We have two tables State_Tab and City_Tab. An SQL JOIN clause is used to combine rows from two or more tables, based on a common field between them. The most common type of join is: SQL INNER JOIN (simple join). An SQL INNER JOIN returns all rows from multiple tables where the join condition is met. 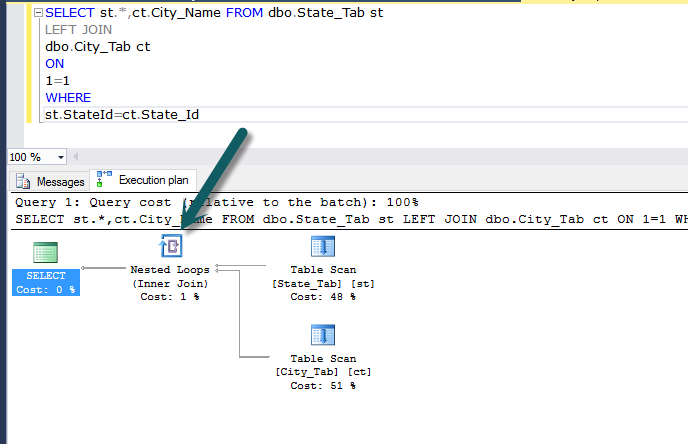 Now, we write two queries, using outer join, and compare the execution plan of both the queries. We can see that both the queries use the left outer join but the second query implements the inner join, instead of outer join, because for "On condition", we define the 1=1, which will be always true, so the query optimizer converts the left outer join to cross join due to the "Where condition". This cross join will convert into the inner join.